The renders reveal the Huawei phone in three different colours - Black, Blue and Twilight, all of them having solid black bezels on the front to blend well with the display when switched off. The Twilight variant stands out among the three with a blue-ish pink gradient finish, similar to the one of the Huawei P20 Pro. Set for an unveiling on October 16, the Huawei Mate 20 Pro is expected to follow in the footsteps of the Huawei P20 Pro for employing a triple-camera setup at the back. That said, the Mate 20 Pro has been leaked through a render for the very first time revealing a large notch at the top, an in-display fingerprint scanner and three cameras at the back. While we can’t confirm whether the end product will look exactly the same, the particulars of the phone revealed in the render matches the leaks which were previously talked about. There’s a triple-camera setup which is now arranged inside a square box with the LED flash instead of being vertically aligned on the P20 Pro. Since there’s no fingerprint scanner at the rear end, Huawei could be working on an in-display fingerprint sensor for the Mate 20 Pro. If that’s not the case, the mere presence of a large notch means the Mate 20 Pro could equip advanced 3D face unlock, which could be something the Chinese company can opt for its upcoming phones. Coming back to the imaging department, the Mate 20 Pro is expected to replace the monochrome sensor with a wide-angle unit which will accompany a 5X lossless zoom camera and a 40MP main sensor, like the one on the P20 Pro. 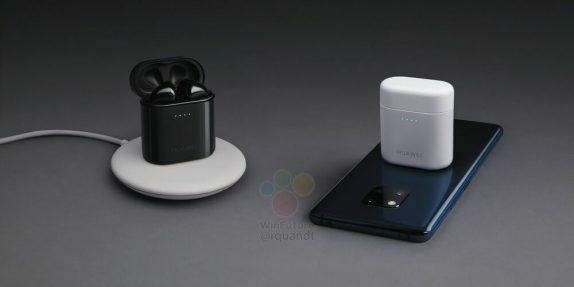 The renders also reveal the upcoming Huawei Freebuds 2 which is shown to be charged wirelessly through the earphone’s case. In addition to this, the Mate 20 Pro is confirmed to be the first smartphone that’s powered by Huawei’s latest Kirin 980 chip built on a 7nm process. The phone will run on EMUI 9 based on the latest Android 9 Pie and will be fuelled by a large 4,200mAh battery with support for wireless fast charging.